When I first started knitting again last fall after my 10-or-so-year hiatus, I was mystified by the concept of 'stash.' I was a starving student as a beginner knitter, and the daughter of a Depression-era mum: the frugality stuck. 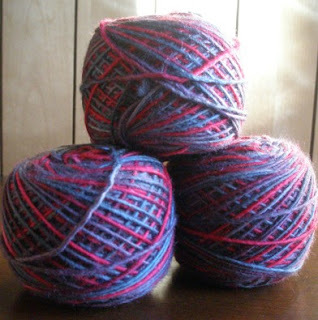 The thought of buying yarn you weren't planning to use for any particular project and cast on for immediately was just weird to me. Then I started looking at luxury and artisan-made yarns that my (evil temptress) friends Karen and Kathi were recommending and thought H'mmm. Maybe I could try a skein or two. Well, now I have a cupboard full of yarn and I get it. It's not just about the yarn being soft or pretty. It's not just about the yarn being useful for a particular project, or being handy should inspiration strike for a particular sort of project. It's about the energy. Seriously! When I buy yarn from somebody who's spun it or hand-dyed it, I'm getting a little piece of her (so far it's always been a her) personal style, something of her energy and the value she places on the materials she's worked with. I got chatting with a new friend in a workshop on the weekend about the energy we pour into particular projects, too, regardless of the yarn used. Like the Lucky Scarf I made that's filled with my gratitude, or the shawl Karen made that's filled with her love. Which is why it is KILLING ME that I will probably have to miss the 2nd anniversary bash at Stitch this Saturday! Particularly since I am still longing for the Americo alpaca she's draped over pegs in the front hall. What I will miss: treats, yarn sampling, shoulder massages from a real masseuse, sale items... honestly. If you knit or sew and you're anywhere near Grimsby, Ontario, you don't want to miss dropping in on May 2nd. I am living proof of just how much. Yarn is potential- it could turn into anything, and while it waits to be *anything*, it sits, beautiful and soft, where I can look at it (and listen to it). A stash is pleasing on every level (except, perhaps, the level where checkbook balancing resides).